A lifetime baseball man, Bill Fischer had a 20-year pitching career followed by 40-plus years as a scout, instructor, coach, and consultant. To nobody’s surprise, he also spent two years instructing Marines. Fischer has been a wealth of wisdom about pitching and life, disseminated in a no-nonsense approach and style. Rick Bailey in the Lexington (Kentucky) Herald described Fischer as “heavyset with a weather-beaten face,” who “stalks around the ballyard menacingly, possesses a vise-like grip, and growls out his words. He loves baseball, especially his life in the major leagues.”5 He also practiced what he preached: He holds (as of 2015) the record for most innings pitched without walking a batter. 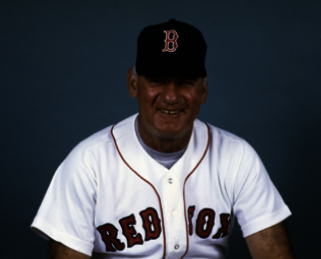 William Charles Fischer, the pitching coach of the Red Sox from 1986 to 1991, was born on October 11, 1930, in Wausau, Wisconsin, to William Constantine and Grace (Chizek) Fischer. William worked in steel, construction, and carpentry. Growing up during the Great Depression, the family “never had much fancy stuff,” Bill Fischer recalled. “Food was very basic and the family had a big garden. My mother canned all kinds of food. We ate lots of potatoes as they were cheap and we lived in ‘potato country.’”6 At the time of the 1940 Census, the family was renting a home in Marathon, Wisconsin, near Wausau. Fischer had two brothers: Thomas, who played in the Chicago White Sox system from 1958 to 1960, and Gary, who played in the Los Angeles Dodgers and California Angels systems from 1964 to 1968. Neither brother made it to the major leagues. Fischer also had a younger sister, Rosemary. The 17-year-old Fischer won his first 10 starts, the first three being a two-hitter, a three-hit shutout, and a two-hit shutout.11 He had a streak of 26 scoreless innings,12 and finished 14-3 with a 2.63 ERA. Fischer returned in 1954 and again pitched for Memphis, finishing 14-12 with a 3.86 ERA and throwing a one-hitter.19 At Memphis again in 1955, he struggled, finishing 5-15 with a 4.85 ERA, but with 10 complete games. Fischer won his first start, 6-2 over the Red Sox in Boston on May 19, pitching 6⅔ innings. Fischer’s roommate, Paul La Palme, relieved him with Ted Williams at the plate representing the tying run. “I didn’t want to let my roommate down,” La Palme said. “Bill has been working awfully hard trying to make good up here. … I gave it everything to save the lead and the victory for him.”26 Williams flied out. Fischer threw a complete-game victory on May 28 against Kansas City, allowing six hits and one earned run. He was 3-1 with a 1.76 ERA at the end of May, but slumped throughout June and July, losing his spot in the rotation. As an emergency starter, he threw his first major-league shutout on September 1 in Kansas City. On the 11th he pitched an 11-inning complete-game victory over the Red Sox, winning 4-1. Fischer finished the season 7-8 with a 3.48 ERA. On June 15 Fischer was traded with outfielder Tito Francona to Detroit for infielder Ray Boone and pitcher Bob Shaw. He continued to struggle, going 2-4 with a 7.63 ERA. On September 11 Fischer was placed on waivers and was claimed by the Washington Senators for $20,000.28 He started three games at the end of the season, going 0-3 with a 3.86 ERA. Fischer struggled with a 4.91 ERA for the Senators in 1960, and was traded to Detroit on July 22 for pitcher Tom Morgan. 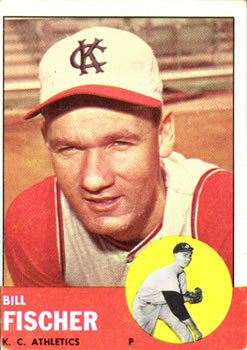 He improved his ERA to 3.44 with Detroit and finished 8-8, but slumped again in 1961, going 3-2 with a 5.01 ERA. He was traded to Kansas City with infielder Ozzie Virgil for infielder Reno Bertoia and pitcher Gerry Staley on August 2.34 Fischer spent the early part of the 1962 season at Triple-A Portland (Pacific Coast League). He was recalled at the end of May and was used mostly out of the bullpen, going 1-0 with a 4.22 ERA at the end of July. Then the streak began. Kansas City owner Charlie O. Finley had promised Fischer a $1,000 bonus if he broke the record, and an extra $100 for every walkless inning thereafter. But Finley claimed he made a mistake with the offer. “You’re going to pay me that bleeping money,” Fischer insisted. Finley did pay, but months later took the amount out of Fischer’s next contract.37 Despite the record, Fischer was winless after August 17, one loss being to Jack Kralick’s 1-0 no-hitter for Minnesota. Fischer finished 4-12 with a 3.95 ERA. Fischer finished 1963 with a 9-6 record and a 3.57 ERA. His ninth victory came over Boston on July 25 when he pitched six innings of shutout relief. It was his final major-league win; he was sent to Triple-A Portland at the end of the season, leaving him eligible for the Rule 5 Draft. Pat Friday, the A’s general manager, told Fischer and said the club wanted to protect some young players and planned to bring him back after the draft. “Well, I was disappointed after the year I had,” Fischer said a year later.42 Meanwhile he was drafted by the Minnesota Twins, a move that reunited him with manager Sam Mele, who was on the Washington coaching staff when Fischer was on the team. Fischer struggled in nine appearances out of the Twins bullpen in 1964, with a bulging 7.36 ERA. On May 22, 1964, exactly a year after the Mantle blast, Fischer threw his last major-league pitch for a walk-off home run by Baltimore’s John Orsino. Fischer was returned to Kansas City and then placed on the retirement list.43 Later in the season, the Twins hired Fischer as a scout, but then released him in early 1965. Fischer, now 36, went 12-4 with a 2.36 ERA in 1967, while also serving as a player-coach for Indianapolis.46 “I want to pitch as long as my arm can help,” he said. “The hitters will let me know when it’s time to quit.”47 His 20th and final season was with the Triple-A Hawaii Islanders. He finished 8-9 with a 3.11 ERA. By this point, the Fischer family was living in Sarasota, Florida. He had three children with his first wife, Joan: Michael, Patti, and Mary Jo. Michael was a catcher on the Riverview High School baseball team in Sarasota. He was drafted by the Reds in the 43rd round of the 1979 amateur draft, but never made it to the major leagues. In April of 2000 Fischer was offered the job of pitching coach of the Tampa Bay Devil Rays. Fischer accepted the position without even asking about a salary, and was on his way back to the major leagues.76 “It’s one more challenge for me. A last hurrah,” he said.77 Fischer stayed on through the 2001 season.78 “Being around these young guys keeps you young. It's like a little medicine.”79 But manager Hal McRae, who had taken over during the season, wanted to make changes in the coaching staff. Fischer learned the morning of the last game of the season that he was being fired. In the spring of 2002, he found himself in the unfamiliar position of nowhere to go for spring training, even though Tampa was still paying him the $100,000 left on his contract. The Atlanta Braves called, however, offering him a job as a part-time scout. He died on October 30, 2018, at the age of 88. An earlier version of this article appeared in "The 1986 Boston Red Sox: There Was More Than Game Six" (SABR, 2016), edited by Bill Nowlin and Leslie Heaphy. 1 Earl Lawson, “Tapes Help Fischer Spot Red Hurlers’ Flaws,” The Sporting News, March 10, 1979: 51. 2 Joe Posnanski, “Royals Pitching Advisor Fischer Shares Wisdom of 60 Years in Baseball,” Kansas City Star, February 24, 2008: C1. 3 Tim Pearrell, “Golden Oldie; Fischer Carries Storied Career to 50-Year Mark,” Richmond (Virginia) Times Dispatch, July 8, 1997: F1. 4 Bob Addie, “The Quiet Man Who’s Loud on the Mound,” Baseball Digest, August, 1959: 79-81. 5 Rick Bailey, “Reds’ Pitching Would Draw Pessimism From Anyone but Fischer,” Lexington (Kentucky) Herald, July 20, 1980: C2. 6 Bill Fischer, interview with the author on September 4, 2015.? 7 “Wausau Trims Indians, 13-6,” Janesville (Wisconsin) Gazette, June 26, 1948: 11. 8 “Sox Story, 9 Years Old, May Become Best Seller,” Chicago Tribune, May 15, 1957: 7. 9 Tom Martenson, “Bill Fischer: ML Record Holder to Begin 44th Year in Pro Ball,” Sports Collectors Digest, November 29, 1991: 150. 11 “Rapids’ Youth Hurls 2-Hitter,” Waukesha (Wisconsin) Freeman, June 15, 1948: 9. 12 “Odd Homers Give Indians Win in 15th,” Janesville (Wisconsin) Gazette, June 18, 1948: 8. 13 “Errors Costly As Bathers Even Set; Final Game Tonight,” Delta Democrat-Times (Greenville, Mississippi), May 11, 1949: 6. 14 Bob Nesbit, “Plan Big Push to Win Pennant,” Terre Haute (Indiana) Tribune, August 30, 1950: 8. 16 “Odds ’N’ Ends,” Rhinelander (Wisconsin) Daily News, January 8, 1951: 6. 17 Burton Hawkins, “Griffs Cheered as Fischer Turns in Another Fine Job,” Washington Evening Star, April 27, 1959: 21. 19 Bill Ferguson, “Birmingham’s Jack Urban Hurls Historic No-Decision No-Hitter,” Anniston (Alabama) Star, August 23, 1954: 7. 21 “Majors Cut Down to Player Limit,” Hagerstown (Maryland) Morning Herald, May 17, 1956. 22 “White Sox Buy M’Donald,” Kansas City Times, July 9, 1956. 23 Edgar Munzel, “Release Tag Ready, Fischer Lands Sox Job, Kinder Departs,” The Sporting News, May 22, 1957: 9. 24 “Fischer Saves Job With ChiSox,” Milwaukee Sentinel, May 14, 1957: 5. 25 Edgar Munzel, “Fischer, Latman Brighten Chisox’ ’58 Hill Outlook,” The Sporting News, September 25, 1957: 9. 26 Hy Hurwitz, “La Palme Pleased to Save His Roommate, Fischer,” Boston Globe, May 20, 1957: 6. 27 “Massachusetts Day Planned By Red Sox,” North Adams (Massachusetts) Transcript, May 29, 1958: 9; Joe Cashman, “Come From Behind Sox Make it 3 in a Row,” Boston Record American, June 8, 1958: 33. 28 “Schofield Hurler Sold to Senators,” Rhinelander (Wisconsin) Daily News, September 12, 1958: 8. 29 Burton Hawkins, “Griffs Cheered as Fischer Turns in Another Fine Job,” Washington Evening Star, April 27, 1959: 21. 30 “Bill Fischer, Haddix Lead,” Sarasota Herald-Tribune, May 6, 1959: 17. 31 Burton Hawkins, “A Feeling of Belonging,” Washington Evening Star, June 19, 1959. 32 Bob Lassanske, “Senators’ Fischer Finds New Life,” Milwaukee Sentinel, May 4, 1959: 5. 33 Shirley Povich, “Hunch-Player Cal Comes Up With New One,” The Sporting News, March 9, 1960: 15-16. 34 “Bertoia ‘Key Man’ in A’s-Tigers Deal,” Boston American, August 3, 1961: 50. 36 John O’Connor, “Control Master; R-Braves Pitching Coach Holds Record for Innings Without a Walk,” Richmond (Virginia) Times Dispatch, August 22, 1998. 38 Jack Hand (Associated Press), “Modesty Is Becoming to A’s Bill Fischer,” Free Lance-Star (Fredericksburg, Virginia), May 21, 1963: 13. 39 “May 22 Means a Big Dose of Trouble for Bill Fischer,” The Sporting News, June 6, 1964: 8. 41 Martenson, 151; Fischer was berated by Lopat in the locker room after the game. “It was like he was screaming into the wind because everybody else was laughing,” Fischer remembered. “It was so funny. Every time Ed would look at a guy, the guy would bust out laughing.” Jane Leavy. The Last Boy: Mickey Mantle and the End of America’s Childhood (New York: Harper Perennial, 2010), 257. 42 Bob Wolf, “Bill Fischer of Rothschild Found Minors Route to Better Opportunity,” Milwaukee Journal, April 4, 1964: 19. 43 “Twins Bomb Angels in Slugfest,” Aberdeen (South Dakota) Daily News, May 26, 1964; “Bill Fischer Placed on Retired List,” La Crosse (Wisconsin) Tribune, May 27, 1964. 44 Johnny McDonald, “Padres’ Streak Ends at 6, 2-0,” San Diego Union, July 21, 1965. 45 “Fischer Snares Coast ERA title,” Eureka (California) Humboldt Standard, September 9, 1966: 5. 46 “Beard Will Return as Indians’ Coach,” Greensburg (Indiana) Daily News, January 6, 1967: 1. 47 “Still Pitching,” Milwaukee-Journal Sentinel, April 23, 1967. 48 “Fischer Inked as Scout by Royals,” San Antonio Express, November 9, 1968: 19. 49 Paul O’Boynick, “Royals Reveal Wide Range of Group Benefits,” Kansas City Times, January 7, 1969: 10. 50 From a biography in Fischer’s file at the Baseball Hall of Fame. 51 Joe Giuliotti, “Sox Hire McNamara’s Men to Coach: Lachemann, Fischer,” Boston Herald, October 30, 1984: 49. 52 Earl Lawson, “Tapes Help Fischer Spot Red Hurlers’ Flaws,” The Sporting News, March 10, 1979: 51. 53 Peter Gammons, “Red Sox Add Lachemann,” Boston Globe, October 30, 1984: 32. 54 Russell Manley, “Good-Natured Fischer Has Made Reds’ Pitching Tough,” Tampa Times, March 12, 1980. 55 “Fischer Says Season With Reds His Best,” Lexington (Kentucky) Herald, September 20, 1979: C3. 56 Bill Conlin, “All-Star Team of Castoffs Reflects a Huge Turnover,” The Sporting News, May 31, 1980: 22. 57 Earl Lawson, “Seaver, Pastore Big Wheels of Reds Staff,” The Sporting News, March 15, 1980: 44. 58 Tim Sullivan, “Fischer Pitching Advice More Spit Than Polish,” Cincinnati Enquirer, August 7, 1981. 61 John Brockman, “Sarasota’s Fischer Named Reds’ Coach,” Sarasota Herald-Tribune, December 2, 1978: 3-D; Fischer interview. 62 Tim Pearrell, “Fischer Gets Call From Rays,” Richmond Times Dispatch, April 13, 2000. 63 Larry Whiteside, “Fischer Is Having a Ball,” Boston Globe, September 19, 1986: 69. 64 Joe Giuliotti, “A Record for the Rocket,” The Sporting News, May 12, 1986: 19. 67 Michael Madden, “Fischer: Controlling Interest,” Boston Globe, June 23, 1986: 27. 68 Joe Giuliotti, “Evans Swings to Bench With Hamstring Pull,” Boston Herald, September 19, 1988: 102. 70 “Fischer Keeps His Mouth Shut,” Boston Herald, October 13, 1991: B4. 71 Larry Whiteside, “Clemens Again a Young Man; Sox Ace Named Best AL Pitcher for 3d Time,” Boston Globe, November 14, 1991: 65. 72 The Sporting News, December 27, 1993: 30. 73 “Pitching Mentor Marks 50th Year,” USA Today, August 4, 1997. 75 Jon Solomon, “Ceremony Moves Fischer After Half-Century of Work,” Richmond (Virginia) Times Dispatch, August 4, 1997. 76 Marc Topkin, “Rays Fire Williams, Hire Fischer to Take His Place,” St. Petersburg (Florida) Times, April 13, 2000. 78 Marc Topkin, “McRae, Wanting His Own Staff, Fires Fischer,” St. Petersburg (Florida) Times, October 8, 2001. 80 Bill Shanks, “Instructional League Report: Part One,” published October 28, 2003, at scout.com/mlb/braves/story/194841-instructional-league-report-part-one. 81 “Royals Minor League Coaching Staffs Announced,” published January 9, 2015, at wibwnewsnow.com/royals-minor-league-coaching-staffs-announced/. 82 “Royals Pitching Advisor Fischer Shares Wisdom of 60 Years in Baseball,” Kansas City Star, February 24, 2008.